Knowledge of your heart structure and its function will help you appreciate how this important organ works to pump blood to the whole body. Although it is barely the size of a human fist, the heart is a powerful muscle inside the chest, with a cone shape and a pointed end facing the left. This is a fibrous covering that wraps around the heart and holds it in place. This special membrane also contains a fluid which lubricates the heart in the pericardial space or cavity to prevent friction. The pericardium has two layers, consisting of a visceral layer directly coving the heart and a parietal layer, which forms a sac containing the fluid in the pericardial cavity. The epicardium, or the outermost layer of the heart, is a thin layer of membrane that lubricates and protects the outside portion of the heart. The myocardium, or the muscular layer of the heart wall, consists of the muscle tissue. It consists of the majority of the thickness of the heart and is responsible for the pumping action of the heart. The endocardium, or the innermost layer that lines the inside of your heart, is a smooth lining that keeps blood from sticking to the heart and prevents the formation of potentially harmful blood clots. Atria are smaller than ventricles and have thin, less muscular walls. They are the receiving chambers of the blood, which is delivered to the heart by the large veins. Ventricles are the larger, more muscular pumping chambers that push blood out to the circulation. They are connected to large arteries that carry blood to the circulation. The right atrium and the right ventricle are smaller than the corresponding chambers on the left. They have less muscle in their walls compared to the left side of the heart. The difference in size is related to their functions. Blood from the right side of the heart goes to the pulmonary circulation while blood from the left chambers is pumped to the rest of the body. Arteries deliver oxygen-rich blood from the heart to the rest of the body. The biggest artery is the aorta, which leaves the heart and gives off smaller branches. Veins deliver deoxygenated blood back to the heart through theinferior and superior vena cava, which drain into the right atrium. Capillaries are microscopic vessels that connect arteries to veins. These are fibrous tissue flaps found between the cardiac chambers and within the veins. They serve as gates that ensure one-way flow and prevent the backflow of blood. 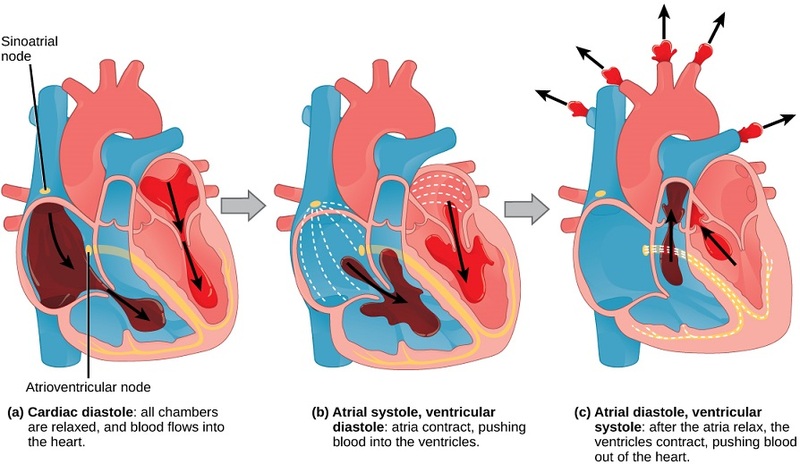 Atrioventricular valves are found between each atrium and ventricle. The valve between the right atrium and ventricle is the tricuspid valve, while that found between the left atrium and ventricle is called the mitral valve. 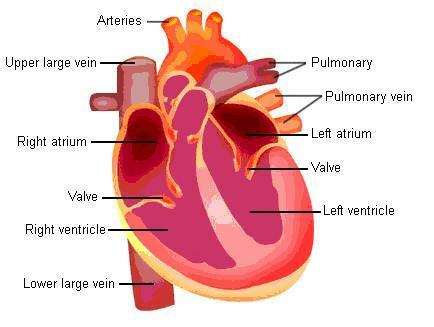 Semilunar valves are found between the ventricles and the large arteries. There is an aortic valve between the left ventricle and the aorta and a pulmonary valve between the right ventricle and the pulmonary artery. The heart pumps blood to the pulmonary and the systemic circuits. Pulmonary circuit. Deoxygenated blood from the right ventricle enters the pulmonary artery and goes to the lungs where it receives oxygen and releases carbon dioxide. The oxygenated blood then returns through the pulmonary vein to the left atrium. Systemic circuit. Oxygenated blood is pumped from the left ventricle to the systemic circulation through the aorta, which branches out into smaller arteries and capillaries to supply the rest of the body with oxygen. From the different organs and tissues, deoxygenated blood returns to the heart through the veins, which drain into the venae cavae, and into right atrium. Heart structure and function can also be described by the Cardiac Cycle: The heart's main function is to pump blood to the circulation. This is accomplished by a series of contractions (systole) and relaxation (diastole) of the heart muscle, which occurs in a rhythmic or cyclic pattern. The right atrium, which has been filled with blood from the circulation, contracts and empties blood into the relaxed right ventricle, with the tricuspid valve open. Almost at the same time, blood from the left atrium, which has come from the lungs, empties into the left ventricle, through the open mitral valve. During this time, the valves in the venae cavae and the pulmonary vein are closed to prevent the backflow of blood. After contraction, the atria relax, the atrioventricular valves close, and the ventricles simultaneously contract with a higher pressure to pump blood into the lungs, via the pulmonary artery, and the systemic circulation, via the aorta. After pumping out blood, the ventricles relax and the pulmonary and aortic valves close to prevent backflow. Refilling of the right and left atria occurs as they relax and start the whole cycle once again. The cardiac cycle produces a heartbeat, which usually takes less than a second. Your heart rate or number of heart beats per minute depends on your level of activity, so you have a slower rate when you are at rest and a faster rate during exercise. The human heart is just roughly about the size of a fist. Your heart weighs about 10 - 12 ounces (or 280 - 340 grams) if you are a man, and 8 -10 ounces (or 230 - 280 grams) if you are a woman. In an adult, the heart beats at an average of 60-80 times per minute. The newborn's heart beats faster than an adult heart, at about 70-190 beats/minute. Your heart beats at an average of 100,000 times/day or about 3 billion times in your lifetime. Your heart pumps about 5-6 liters of blood in your body. What Is the Difference between Pulmonary Circulation and Systemic Circulation?